According to Locus Online and Comic Book Resources, fantasy and comics artist Frank Frazetta has died of a stroke at the age of 82. Frazetta revived the field of fantasy art with a fresh sense of the iconic image, drawn from his own vivid sense of drama and conflict. His moon maidens, thundering dragons, and sword-wielding barbarians took on a powerful life of their own, which shaped the imagination of many artists working today, me included. I had the privilege of working as a background painter on his animated film Fire and Ice, released from Baskhi productions in 1983 (poster image above). We always tried to get Frank to give the studio a class on figure drawing and composition, but he never did, probably because much of what he did was intuitive. That intuition, combined with a fierce confidence in the power of pure imagination, made his images unforgettable and truly immortal. That's truly something. I was good friends with his grandson in school, and I know he had a huge influence on him and his artistic identity. That's very very sad news. A big fan of his art. Yes, and I loved 'Fire and Ice'. Wow, there goes a legend. He goes to good company. the man made fantasy art what it is today, and he will be sorely missed. 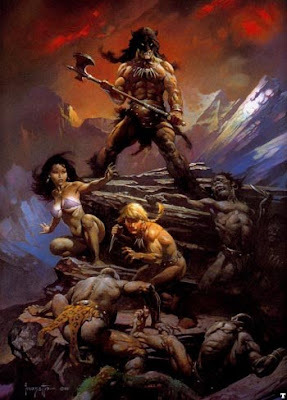 As I said in the thread on conceptart.org, I'm pretty certain noone in the entertainment industry would be what they are today without the influence Frank Frazetta's had on it. Rest in peace. Frank Frazetta was one of the greats. He will be missed. A singular creative genius! Rest in peace Mr. Frazetta. Thank you for the wonderful art and inspiration. A tremendous loss. The junior high students will be getting a "Frazetta" assignment to help them mourn his passing. Condolences for the loss of your partner-in-crime in that lost age of hand-drawn animation. I owe my career to you Frank. Thank you. What a shock. What a loss. That is sad news. I cannot help but wonder though, if you had gotten those lessons from Frazetta, Dinotopia might have been a different book! It is really sad that one of the most important fantasy artists has passed away. I really loved his work. At the 12th or 13th class at school we had to present an artist and one of his or her works at the art course. I choosed Frank Frazetta because I was so deeply impressed by his work and made an hour-long presentation and artistic analyse of "Conan chained". It was probably the most unconvential artist and painting presented in the class. It is still sad that even great art as those of Frazetta is often not seen as real art, but more as some kind of pulp. The paintings of Frazetta have nearly never really kitschy elements, all things look plausible. The way in which he painted reminded me often to some degree to the works of Burian, especially to the paintings of Burian which show early man confronted with prehistoric beasts, or his depictions of people from bronze-age cultures, which sometime really look similar to stereotypic barbarians. I really love the movie "Fire and Ice" and have watched it for many times. Of course the story is not, well, that profound, but it is still a great movie. Especially the backgrounds which are painted with so much love to all the wonderful little details, and this phantastic fantasy world with its countless amazing and deadly inhabitants. Some of the animations like those of the growing glaciers looks somewhat funny, but many of the other animations made by by motion-capturing are among the best I have ever seen at animated movies, especially the scenes with horses. James, would you ever consider doing a feature on your backgrounds for Fire and Ice? Im interested in becoming a background painter or layout artist myself and I'm wondering what special things you had to consider when you were designing. You visited my school (RMCAD) a while ago and signed my Chandara book. If you have the time, check out my portfolio!